The Jharkhand High court is going to recruit stenographer posts. There are total 149 posts which are going to filling up through this High Court recruitment process 2018. All fresher candidates can apply these High court jobs. Those who are looking for Government jobs in Jharkhand State this is a great opportunity for them to grab a Government job in India 2018. More information related to these Government jobs is given below in this post. Read the whole post carefully for detailed information related to this High court recruitment 2018. Candidates must be Graduate from a recognized University on or before the last date of compliance of online application form. Applicant must have good ability in English shorthand and in typing. The pace of shorthand would be 100 words per minute & typing would be 40 words per minute in English on laptop/computer with maximum allowable mistakes up-to 10%. How much to be paid as Application Fee for this High Court Recruitment? How to apply online for this High Court Recruitment 2018? 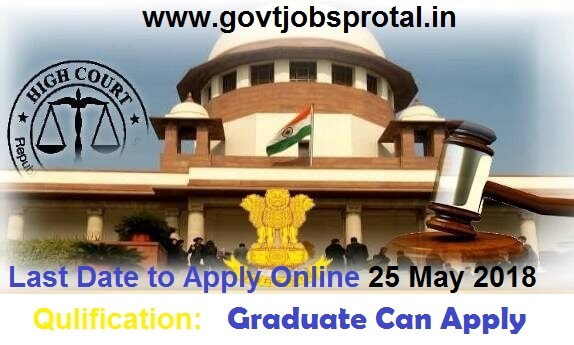 We advise all Indian candidates to apply online with the official website. There is no other way to apply for these high court jobs in India. We share the link below for applying online. 25 May 2018 is the Last Date to apply.